Wow. When I put it out there that I was interested in taking part in the Eat Local Challenge, I didn’t realize what a…challenge it would be. I say that not for the reasons you think I am. There are plenty of resources in my area to utilize to eat almost entirely local – save for dry goods and grains and such. In relatively close proximity to me, there are farm stands and markets every day of the week but Sunday and Monday. For those off days, I found that a trip to the large farmers market near me provided three shopping bags of produce grown locally – going only as far as south carolina – for less than $20. It’s been fun, in that regard, to use what the market provides and just wing it from there. The problem is…that this has been a terrible week to try this. Between Downtown Restaurant Weeks plans, dad’s hospital stuff (i can assure you that there is nothing local about hospital food. I’m not even sure it’s food), and a day trip for a meeting with a pasta-heavy client…I haven’t had a lot of time to even TRY and eat locally. The days that I have were very successful…and I am going to continue my challenge into the next week. I’ve also used the EC as inspiration for my upcoming Atlanta Cuisine article featuring one of the most beautiful salads I’ve ever made. This is something I am committed to not just next week but continuously as long as the markets and farm stands allow. On my trip to the DeKalb Farmers Market, there was a bevy of locally grown peas. To make the decision even easier, the pink-eye peas and the field peas were in a large bin, already shelled. While it’s more expensive to buy them that way…it’s also more convenient during a hectic week like this past one. I used up the rest of my tomatoes from the Decatur Farmers Market and dressed it with a tangy mustard vinaigrette. To make it a little heartier, I used some barley from the pantry. This is completely optional. It does give the veggies some oomph without cloying their taste and would make a great BBQ salad to roasted chicken or grilled salmon or other firm fish. 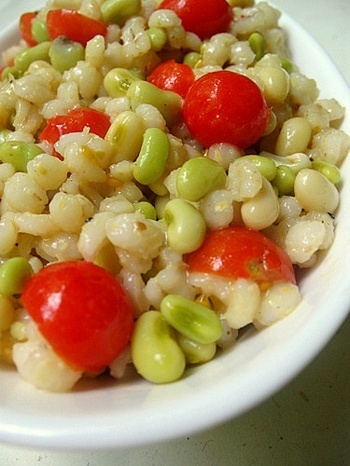 Mix halved tomatoes, peas, and barley together in a bowl. Whisk together vinegar, mustard and honey. Salt and pepper the salad to taste. Allow to sit at room temperature – covered – for 30 minutes before serving or until it comes to room temperature. If making ahead of time, mix all ingredients together except for the barley and add it at the least minute so the barley doesn’t get mushy! And you didn’t invite me to dinner? Humph!